Until recently, all life on Earth was believed to be dependent on the sun. But in the last 30 years, several new deep-sea ecosystems have been discovered that utilize an alternative source of energy. Deep-sea hydrothermal vents form as a result of volcanic activity on the ocean floor. Water seeps through cracks in the Earth's crust, dissolving metals and minerals as it becomes super-heated from nearby magma. This water - which can reach temperatures of 400°C - eventually rises back through the ocean floor, erupting as a geyser from a hydrothermal vent. The dissolved minerals and metals precipitate on contact with the cold sea water, forming a chimney around the vent. When scientists first discovered these vents in the 1970s, they were amazed to find thriving communities of shrimp, crabs, giant tubeworms, clams, slugs, anemones, and fish. These rare geological features turned out to be oases on the otherwise sparsely inhabited ocean floor, with a biomass equivalent to that of a rainforest. At first glance, the animals inhabiting deep-sea hydrothermal vents may not seem so dissimilar to other deep-sea creatures. But in fact, they are unlike any other life on Earth. Instead of sunlight, vent life relies on hydrogen sulfide - more commonly known as rotten egg gas and toxic to most land-based life. In a process called chemosynthesis, specialized bacteria create energy from the hydrogen sulfide present in the mineral-rich water pouring out of the vents. These bacteria form the bottom level of the food chain in these ecosystems, upon which all other vent animals are dependent. Vent microorganisms are unique in other ways, too. They can survive temperatures of up to 113°C, the highest temperature recorded at which an organism can live. Even complex animals such as tube worms can live at 80°C, much higher than any other animal. Apart from hydrogen sulfide, vent water also contains poisonous heavy metals and is more acidic than vinegar. Biologists still don't know exactly how vent animals survive in these conditions. More than 300 species have so far been identified in deep-sea hydrothermal vent ecosystems, of which over 95% are new to science. Many are restricted to a particular vent field, making each ecosystem unique. On average, a new vent species has been discovered every 10 days since vent ecosystems were first discovered in 1977. Amazingly, vent life has changed little over time. A whole new domain of life was discovered in vent ecosystems - Archaea, an ancient form of life most closely related to the first life on Earth. Other vent life also appears to be more closely related to ancient animals than to animals living closer to the ocean's surface. Indeed, vent animals on opposite sites of the globe are more closely related to each other than to those living outside the vent ecosystem, just a few metres away. Some researchers have speculated that life began in extreme environments similar to hydrothermal vents. Others have even suggested that if these environments exist on other planets, then life might very well exist there too. Chemicals also seep from the Earth’s crusts at some locations, at the same temperature as the surrounding seawater. Since the discovery of vent ecosystems dependent on hydrogen sulfide, scientists have found similar communities living around these so-called ‘cold seeps’. Others have also been found that rely on methane instead of hydrogen sulfide. Some of these are around bizarre deep-sea lakes called 'brine pools': depressions in the sea floor filled with water that has a much higher concentration of salt then the surrounding water. And recently a tube worm community was found living on solid methane hydrate on the ocean floor. Apart from temperature and the chemical used for energy, a major difference between vent and cold seep ecosystems is the rate of growth. Vent creatures generally grow fast - giant vent tube worms are one of the fastest-growing animals on Earth. They need to be: hydrothermal vents generally only exist for a few decades. However, their cold seep cousins grow much more slowly. Seep tube worms, for example, are thought to live for up to 250 years. 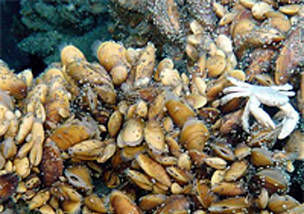 The deepest cold seep ecosystem discovered so far is located in the Sea of Japan at a depth of 5,000 to 6,500m. Other cold seeps and ‘chemosynthetic biological communities’ have been found in the Gulf of Mexico, the Monterey Canyon off the coast of California, US, and off the coast of Alaska, US. The discovery of hydrothermal vents and cold seeps shows that life can also exist inependently of the sun. The unique communities here derive their energy from chemicals rather than sunlight.